Shelley Bean: It's a New Year! Let's have a Sale-A-Bration! It's a New Year! Let's have a Sale-A-Bration! Hello Readers! I want to welcome you back to my blog and tell you about all the fun things going on right now with Stampin' Up! Now through May 31st, for every $50 purchased, you can choose a FREE item from our Sale-A-Bration catalog. These are new and exclusive items that you can view right HERE. 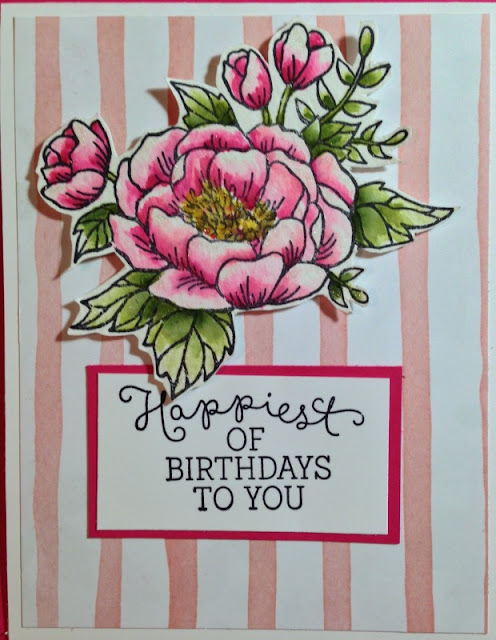 Additionally, our new Occasions Catalog is also available and it is filled with lots and lots of new stamp sets, designer papers, die sets and products that are not currently in our annual catalog. You can look that catalog over HERE. And if you decide to place an order with me and your purchase is $150 or more, you qualify for even more free product along with the 3 "free" items. Here is an example of card that I made with the new Birthday Blooms stamp set in our Occasions catalog. I used blender pens to "paint" the image with ink. Right now is the best time ever to become a demonstrator. And before I go too far along those lines I'd like to mention that it is perfectly fine to sign up as a hobbyist. This means you don't have to sell to anyone other than yourself. Of course, if you'd like to demonstrate and share these great products, it's a wonderful way to make a business sharing what you already love. Normally, to sign up, for $99 you can choose any products you like that value $125.00. But, during Sale-A-Bration, now through May 31st, you get $155.00 worth of product. What a great way to get started. If you would like to take this opportunity, please follow this Join my Team link. *Buy $99 kit and receive your own personal discount on all future orders while a demonstrator! *Learn how to run as a business or as a hobby demonstrator! *Join a group of wonderful new friends!